Home › R-Tech Rvd70B-Hd 1000Tvl Dome Security Camera Dark Gray - Outdoor - Night Vis..
2.8-12mm lens allowing for a larger viewing area. Back light compensation (BLC) to ensure optimal picture quality in any given lighting condition. 98ft IR range with superior video quality in complete darkness. 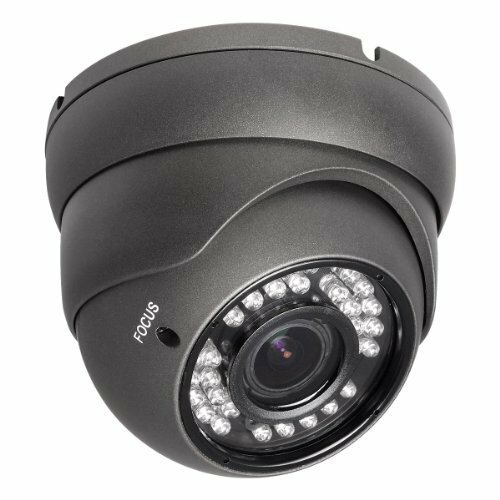 This 1000TVL analog camera brings true HD quality video to your surveillancesystem, night or day, rain or shine! The IRD100-HD requires a 1 amp powersupply and BNC video/power cables (sold separately). 2.8-12mm lens allowingfor a larger viewing area. Back light compensation (BLC) to ensure optimalpicture quality in any given lighting condition. 98ft IR range with superiorvideo quality in complete darkness. Outdoor metal housing made to withstandtough weather conditions and vandalism. Lookatool Smart Wrist Band Sleep Sports Fitness Activity Tracker Pedometer Br..